Most commonly referred to as flu, influenza is a viral disease that affects birds and mammals alike. The symptoms of the flu include fever, sore throat, coughing, muscle aches, nausea, vomiting, wheezing, dizziness, tiredness, and gastrointestinal complications. 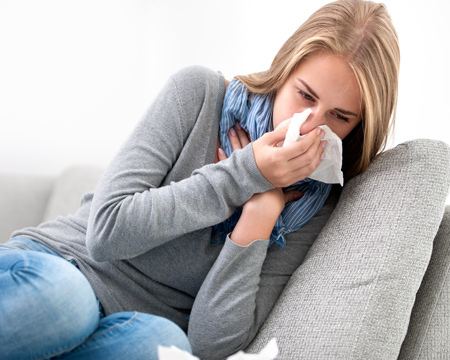 Flu can sometimes lead to severe pneumonia and even death. Who are at the risk of contracting the Flu? Babies, pregnant women and people at older age are at the highest risk of complications from the influenza virus. However, there are specific strains of flu that have significantly affected the younger population and adults. If you get in close contact with the infected people, the chances of getting infected are higher. One can use soap, disinfectants, and sunlight to kill the virus easily. Still, influenza is seasonally epidemic with around more than 5 million annual cases worldwide. Every year, about half a million people die from flu. The virus quickly mutates and has resulted in pandemic incidents throughout history. The epidemic flu strain mutates every year, making it challenging for doctors and health officials to predict which type will affect the masses in any year. It is significantly advised to get vaccinated against the most likely endemic flu virus on an annual basis. How to get the flu vaccination in Norbury, Croydon or Streatham Vale? The influenza virus is recognised for its extreme resilience and can live on a contaminated solid or non-porous surface for two days maximum. After being landed on the skin, the virus lives for about 5-7 minutes. If the body mucus protects the virus, it can easily survive for up two weeks. During the flu season, if you handle the money, make sure to wash your hands with soap and water often. Do I need a Flu vaccination before travelling? If you are planning on travelling, it is essential to get a flu vaccine shot against the most prevalent strain of influenza for that season. You should get your immunisations a minimum of 2 weeks before you leave the UK to give them enough time to become effective.